This digital download contains the audio files you will need. You DON’T need to order the 99-cent audio download. NOTE: This digital download gives you everything you need. It is exactly the same as the paperback, but it also gives you the audio files. 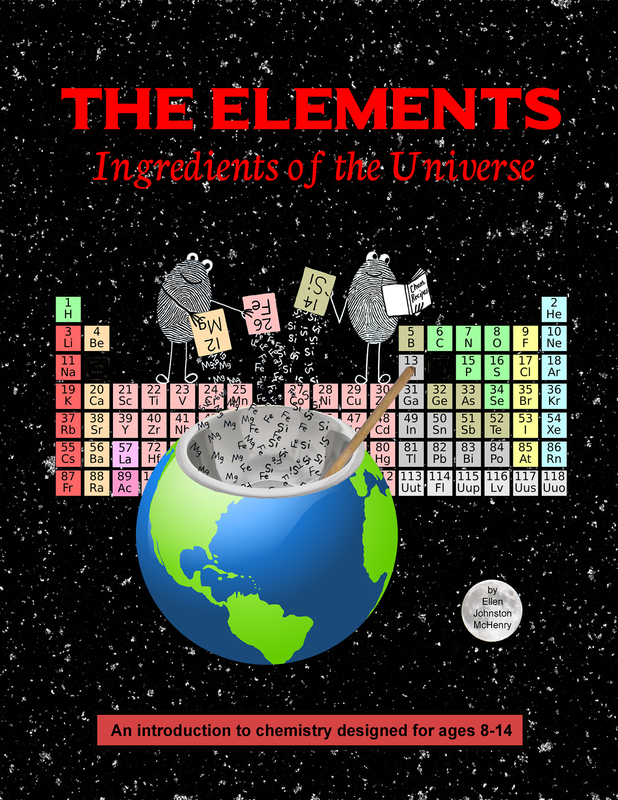 Description: A basic introduction to the fundamental concepts of chemistry (see “Topics covered” below) but with the interest level of the text and activities geared to students who still like to play while they learn. The student text combines very “meaty” content with whimsical humor, and the teacher’s section has lots of activities, games, songs, crafts, etc. All of these activities provide high-quality learning– they are not “fluff.” The overall theme of the curriculum is cooking and recipes, using cooking to explain chemistry concepts. The curriculum is intended to prepare students for high school chemistry. Topics covered: The definition of an element, the structure of an atom, the invention of the Periodic Table by Mendeleyev, chemical formulas, electron orbitals and shells, the octet rule, arrangement of elements on the Periodic Table, atomic bonding (covalent, ionic and metallic), plus an up-close look at the families on the table: alkali metals, alkali earth metals, transition metals, true metals, non-metals, halogens, noble gases, and lanthanides and actinides. Activities included: “Symbol Jar” game, “Elements Fishing” game, “Make Five” game, “Quick Six” game, “Chemical Compounds Song”, “The Bonding Song”, Periodic Table jump rope rhyme, Periodic Table pillowcase craft project, skits about the discoveries of some of the elements, lab experiments, building models of atoms, Element trading cards art project, and links to sites on the Internet where you can play games about the elements or see dangerous experiments that you could not do at home. NOTE: Some of these activities, such as the Periodic Table game, are available for free download on this site, so you can do further previewing by checking out the chemistry section of the free downloads page. Student text booklet: 70 pages divided into 8 chapters. The text is kid-friendly without being patronizing. (They’ll love the Atomic Chef!) It contains all the information they need to know, so there is no extra teaching required by the adult administering the program. The parent/teacher can learn along with the student. No previous knowledge of chemistry is required! This booklet also has pencil and paper activities such as word puzzles, as well as suggestions for activities the student can do at home, including a YouTube playlist created [by me] for this curriculum, and also safe websites they can visit. Time requirement: This curriculum takes 6-9 weeks depending on how many hours a week you put in, how many times you play the games, how much time you spend on the crafts and skits, and how many of the “extras” you decide to do. When my homeschool co-op runs this class, we have 7 class periods (once a week for 7 weeks) that last 3 hours each time. We expect the students to do all the reading and pencil and paper activities and some of the online activities at home. We do all the games and group activities in class. Some of the kids don’t get to spend as much time on activities (such as trading cards) as they would like, but we encourage them to keep working at home. If we don’t have time to perform the skits, we just read them out loud as “reader’s theater.” Since we have Internet access and a video projector at our rented facility, we show some of the video clips in class for the benefit of the kids who don’t have Internet access. The teachers prepare all the games ahead of time so no assembly has to be done in class. If you are doing this curriculum just at your home, you can set your own pace and take as long as you like. Can Ellen give me personal recommendations for how to use this curriculum? No, not really. It’s up to you to look it over and decide how to use it. You are more qualified than I am to make decisions for your student(s) or your group. I don’t know your kids as well as you do. You can pick and choose activities that you think make sense in your situation. You don’t have to use all the activities. You’re in charge. Can I get a materials list so I can buy all the supplies ahead of time? I don’t provide a materials list because I want you to read over the activities first and then choose which ones you want to do. There may be some activities that you want to skip. It doesn’t make sense to buy supplies you won’t need.